Well, Dex, fall is here. It's a perfect time to go apple picking, and get out in the fresh air. You can't get fruit more locally than by grabbing it yourself and plucking it off the tree. How green is that? I don't think it's green enough, Izz. 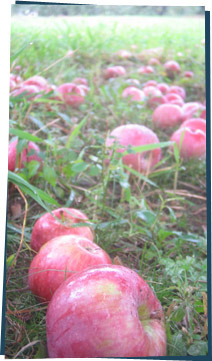 We should be apple PUTTING instead of apple PICKING. Look around. The ground beneath these trees is covered in apples. We should be putting them back. And don't get me started on leaves. It will take forever to stick them all back on. C'mon, Izz. There's lots to do. Grab a handful and.... Izz?.... Izz?